The Elongated tortoise derives its name from its distinctive narrow carapace or shell. Nearly 12 inches long, the tortoise posseses a unique carapace ranging from caramel to yellowish–dark brown in color. Dark blotches are present on every scute with a pale yellow color exhibited on the head, whereas the other delicate parts vary from gray to yellow. The anterior portion of the front legs is covered by large scales, while the hind legs do not sport any such feature. Both the males and the females develop a pink color around the nostrils and eyes during the breeding season. The males are narrower than the females and have shorter tails with more concave plastrons. As an adaptation of nest making, the female has more curved and longer hind claws as well as looks much rounder. 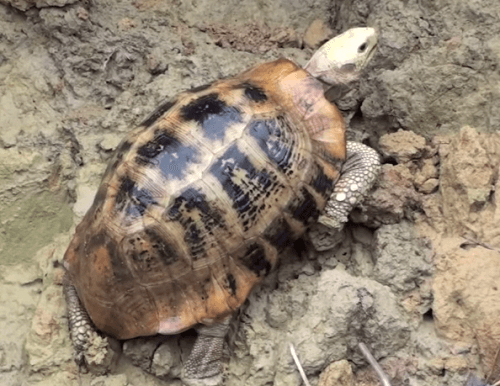 Where is the Elongated Tortoise found? Not being able to swim, the elongated tortoises are tropical creatures that prefer staying in a densely planted habitat. Although they can sometimes be spotted in dry areas, it is primarily a damp forest species. They reside in a wide range of geographical locations including southern and southeast Asia, Myanmar, North east India, Nepal, Laos, Bangladesh, Cambodia, The Malaysian peninsula and Thailand. As adults they get to around 30 cm (12 inches) long and 3.5 kg (7 pounds). Females tend to be wider than males and more rounded. Age wise the elongated tortoise lives to about 50 years old. Elongated tortoises are omnivores and feed on insects, carrions and slugs alongside leaves and fruit. A diet consisting of 80% green leafy matter and 20% fruits is just perfect for a pet tortoise. Kale, watercress, parsley and spinach are the preferred green stuff, whereas the fruit matter may include grapes, banana, tomato and melon. Sometimes, one can also feed them with mixed lettuce and mushrooms. Nutrobal is an essential food supplement to be included in their diet alongwith the availability of fresh water at all times. The elongated tortoise is an endangered species experiencing a major decrease in population. Their common predators include humans, crocodilians, jaguars or other omnivorous pet animals. The species remains in huge demand in food markets, which has led to the development of several laws for their protection. Elongated tortoises are really active during the dusk and dawn due to their large eyes that makes them adapt very well to low lighting. Breeding continues throughout autumn and summer. The males exhibit an aggressive sexual behavior, ramming the female quite violently and vocalizing loudly. Some other common features include biting her around the head, neck and hind legs. The longer and extra curved hind claws of the females helps them in making a flask shaped nest for laying the eggs in. They prefer soft, damp soil for building the nest and the the eggs hatching after a period of six months. A group of eggs is referred as a clutch and about 3 clutches are laid by the female per season when they are kept in captivity. An outdoor enclosure is the most suitable way to take care of the hatchlings, but an indoor enclosure with a good ground leaf cover also works quite good. You should keep them in a shaded area, or in vivariums with day temperatures ranging from 80-88 degrees Fahrenheit. Providing a bathing pool to ensure the required humidity is advised as this species loves long baths. It is essential to provide appropriate UVB lighting while keeping them in a vivarium to promote the production of Vitamin D.
So, back to you! What do you think? Was this a helpful guide? Do you have an Elongated tortoise? Let me know in the comments below!